The last version of CCleaner 5.54.7088 takes almost the full screen and cannot be resized down. All previous versions did not have this problem. I don't need CCleaner to take 90% of my screen. Any specific reason for this dis-comfortable change? Please see the previous and last versions screenshots attached. The previous app resolution supported a minimum screen size of 800 x 600 pixels. The norm now is 1366 x 768, which has more than twice the number of pixels. CCleaner has very data-dense output and the results window is not big enough to show a good amount of data (especially filenames). We wanted to be able to dedicate more space to this information so fewer user actions are required to review a cleaning report. Before choosing what new size to move to, we consulted global data for desktop screen resolutions. 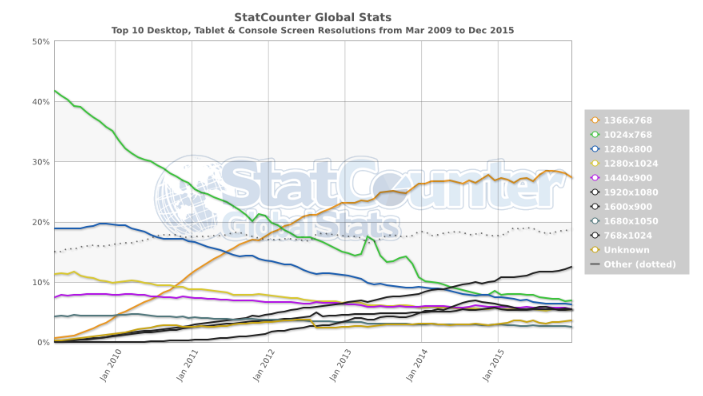 Below you can see the proliferation of larger screen resolutions over the years. We increased the CCleaner app window to fit within a resolution of 1024 x 768, which is used by approx. 5% of the world. While CCleaner does occupy a lot of the screen at this resolution, all the content is still visible. Sorry but once again you seem to have missed the point of the user complaints in this thread. If they were complaining that they couldn't see/read all the content then your reply would be fine. But they are complaining here that they don't want/need to see all the content all the time - so why won't you let the window be sized smaller than 1010 x 700 if the user wants to do that? Anyone who wants it larger could still resize it as they like - up to the maximum of their display if they want that. It's the lack of user choice that is being complained about. So a better reply would not be a justification of what size you have made the window, but a justification of why you have decided that users can't resize it smaller if they want to. I agree - I only installed this update because windows 10 would not run the previous version. Having installed this update, I find that the CCleaner is so dam big that it will not fit within the dimensions of my 14"laptop monitor screen. I can see the Analyse button or the Run Cleaner button because they are off screen. So I thought this is a BUG and I will hack a solution. I used regscanner to discover the registry settings for the screen size and screen location [Computer\HKEY_CURRENT_USER\Software\Piriform\CCleaner] and I will fix the BUG by modifying the registry settings. No this did not work because the programmer wrote some stupid code that prevents the CCleaner from rendering in anything smaller than WINDOW_HEIGHT=921 and WINDOW_WIDTH=1333. This means I can’t use CCleaner anymore unless I connect the laptop to a second monitor ??????????? I feel like I have been transported back in time to the days of EGA and CGI monitors when programming was in its infancy and folks wrote idiot code. I don’t have 20-20 vision anymore which means that I’m obliged to put up with the prejudice of newbies who have not appreciated the subject of ergonomics. This means I can’t use CCleaner anymore unless I connect the laptop to a second monitor ? 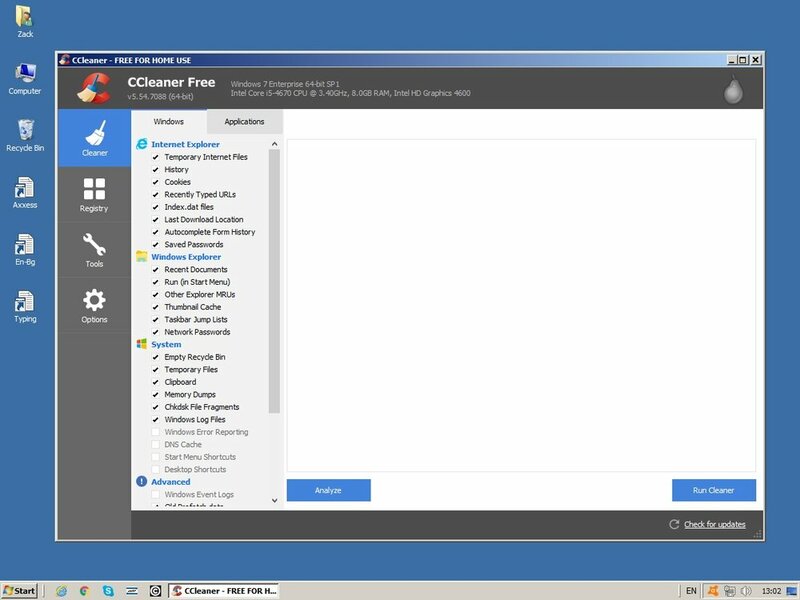 Maximize the CCleaner window and you'll have no issue using it. Leaving CCleaner out of the picture you haven't seen anything yet; the problem gets even worse if for instance on Windows 10 and the scaling size is set higher than Microsoft's recommendations (which is silly and sort of required on a 15 inch or smaller laptop with aging eyesight), then allot of programs run off screen at the bottom and the most annoying are those that have no ability whatsoever to be maximized during operation (Samsung Magician, 7-Zip when compressing an archive, etc.,). It's the main reason should I ever buy another laptop I will never get a 16:9 screen size again because at 16:9 it's great for movies/videos but is crap when using many apps/programs. Hi Keith, we appreciate the feedback but please remember to keep your comments in line with the forum guidelines and free from personal attack. If your laptop supports a resolution of 1024 x 768 or higher then CCleaner can be displayed fully. When we increased the windows sieze, we decided not to clear the existing settings for the position of the CCleaner. However from your comments and others', it's clear that in the minority of cases this may place parts of the window out of view for some users. To solve this, either uninstall and reinstall CCleaner (this wipes all your settings, including your Cookies), or if you feel confident using the Registry Editor, delete the WINDOW_ keys only from 'Computer\HKEY_CURRENT_USER\Software\Piriform\CCleaner'. The latter will keep all other settings intact. Unfortunately CCleaner was built a long time ago and at that time 'responsive design' (having the layout rearrange gracefully to accommodate different window sizes and dimensions) was not a consideration. 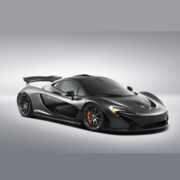 It is something we are working towards but it requires some bigger changes under the hood. I hope this solution works for you and others, but please let us know if it doesn't. Thanks. we decided not to clear the existing settings for the position of the CCleaner. In hindsight disregarding those previous Windows size settings may have averted the need for all the topics complaining about it running off screen.